The South Korean entertainment music program “Immortal Songs 2: Singing the Legend”, was broadcasting a special edition titled “Between Emotion and Passion” back on 2013. This two-parts special edition was having Yoo Yeol –the singer of emotion– and Jung Soo Ra –the singer of passion– as legends. In these two episodes, the performers were divided into two teams, team Yoo Yeol and team Jung Soo Ra. The competition was also not only between performers but also between teams. 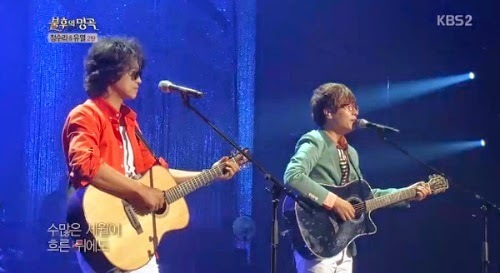 The leader of team Yoo Yeol, male vocal duo Yurisangja, performed on episode 121, which was the second part of this special edition. This episode was broadcasted by KBS television station on October 5th 2013, and later on was aired on October 26th 2013 via KBS World channel. 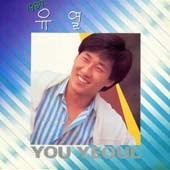 Yurisangja was performing one of Yoo’s biggest hits, “Autumn Rain (가을비)”. Yurisangja when performed "Autumn Rain" on the 121st episode of "Immortal Songs 2"
“Autumn Rain (가을비)” is indeed a song for autumn. Many people in South Korea request this song on the radio during autumn, even until now. This lyrical song of precious memory is also Yoo Yeol’s personal favorite. First released on 1987, this song is also considered as his best by the fans. Yurisangja reinterpreted “Autumn Rain (가을비)” in a very sweet and nice harmony. They showed a performance that softly touched your heart, with a harmonica and their beautiful vocal harmony. Their rendition was like a whispering song through the rain. This is a kind of song that could throw you back in past memories, like a time machine, just like the rain too.